The Bullpup Kalashnikov conversion is one of the most popular and esoteric firearms to have arisen from the Syrian Conflict. Whilst these guns are applauded and disparaged in almost equal quantities on social media, little is known about their origin, functionality and history. 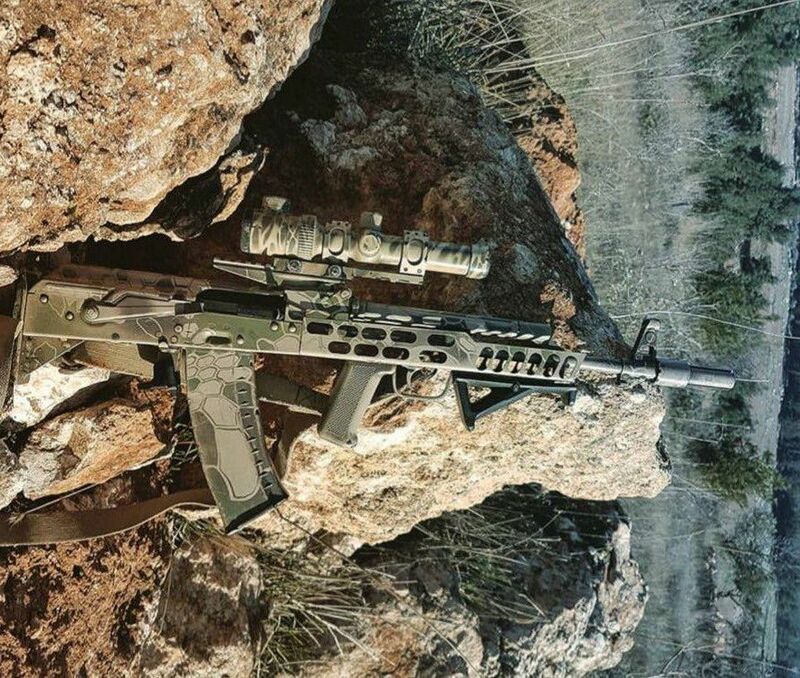 In this post, I will attempt to explain what is known about these rare assault rifles, and analyse their creation, sale, and use in the opposition-held enclave of greater Idlib province. Bullpup: A firearm with its action and magazine behind the trigger. This creates shorter weapons in comparison to convential layout rifles with the same size of barrel. Many bullpups are not ambidextrous, and firing wrong handed (As is the case here) means a left handed shooter will have brass hit them in the face, making it impossible to fire from their dominant side. Some bullpup rifles mitigate this with interchangeable ejection ports and charging handles. 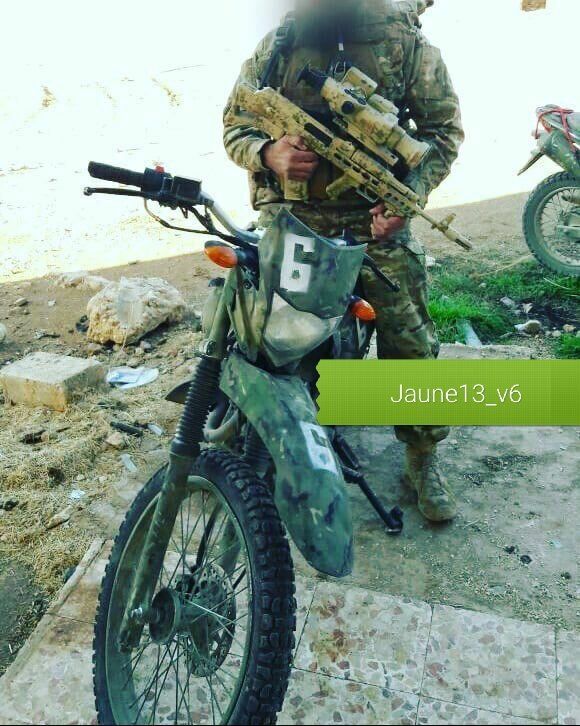 The Idlib AK bullpup does not. The combination of the reliable, simple, and easy to maintain Kalashnikov platform with the compact bullpup layout has been attemped by numerous parties, with varying degrees of success. 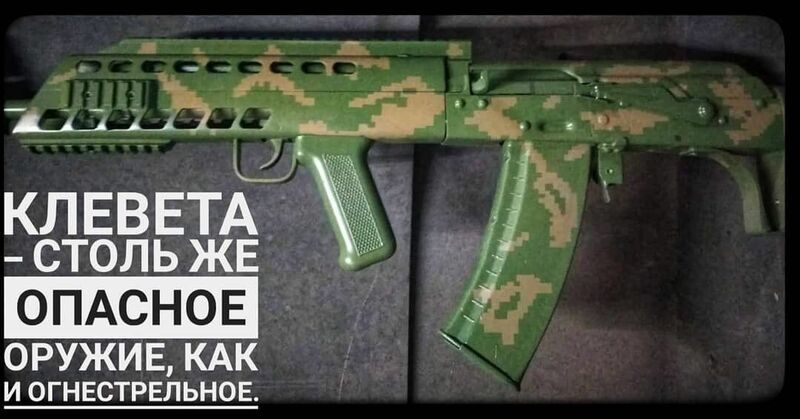 This includes the Ukrainian Malyuk and Black Storm BS-4 rifles, the Russian OTs-14 Groza, and various others, such as the American K-Var AKU-94 conversion kit, sold to consumers. 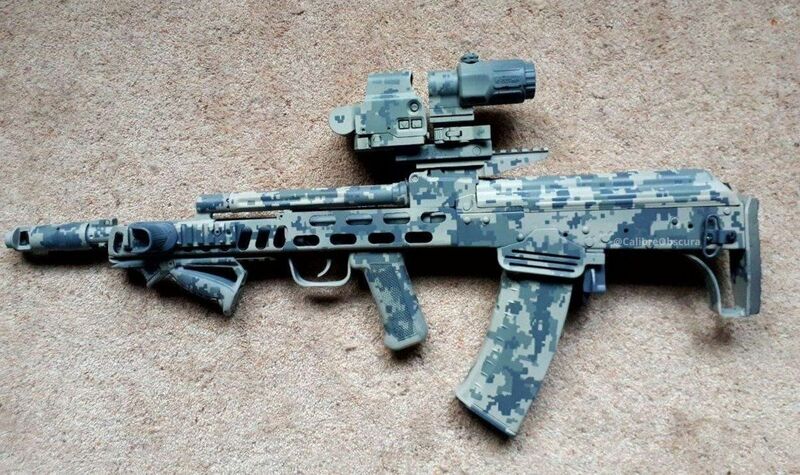 In their most essential form, the Idlib bullpup AK-platform rifles- henceforth referred to as "AK Bullups", are a conversion of an AK platform rifle to the bullpup configuration. The rifles used appear to be almost always original Russian-produced items, with no evidence at all of bullpup conversions of rifles such as the Chinese Type 56 AKM copy. Whilst the essential design of all AK-pattern rifles remains the same, Russian produced rifles are regarded as the best quality AK-pattern rifle in Idlib, in particular the AK-103 and AK-74M, two of the the most modern AK platforms available in the area. However, they are also the most costly, so the original AKM is the most popular candidate for the bullpup conversion. The AK Bullpup conversion is an evolving design, with at least 2 parallel sub-versions of the rifles, which whilst never given visual serial numbers, appear to have entered standardised on-demand production. A small number of rifles do not fit these brackets, probably being early samples or experiments. Optics and accessories used with the AK Bullpups also vary, although trends of what's preferred by the end users is clear. 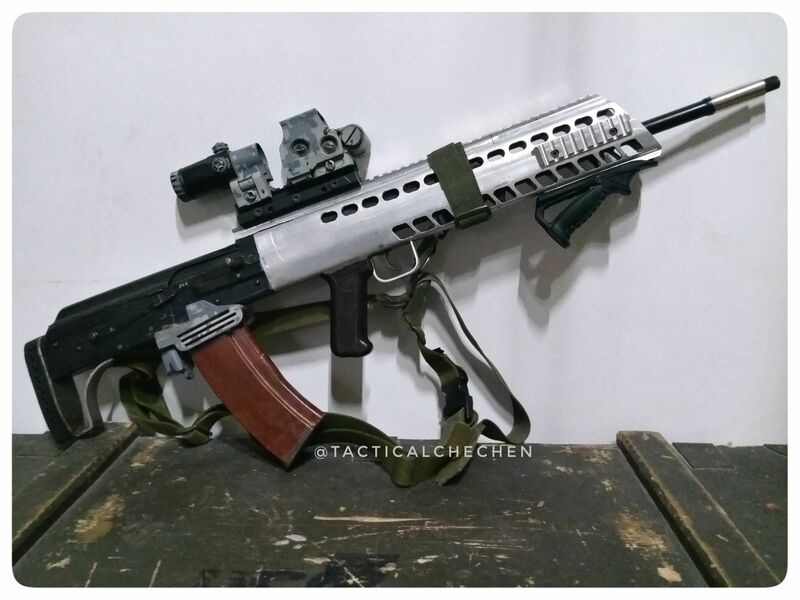 It's extremely difficult to tell when opposition-aligned gunsmiths first attempted to carry out the conversion of AK-platform rifles to the bullpup layout, but initial early examples first appeared on Social Media in late February 2017. The below rifle differs in a number of aspects from current production rifles, so it's unclear if it's a one-off experiment, or among the early prototypes for the clearly indigenous Idlibi design. 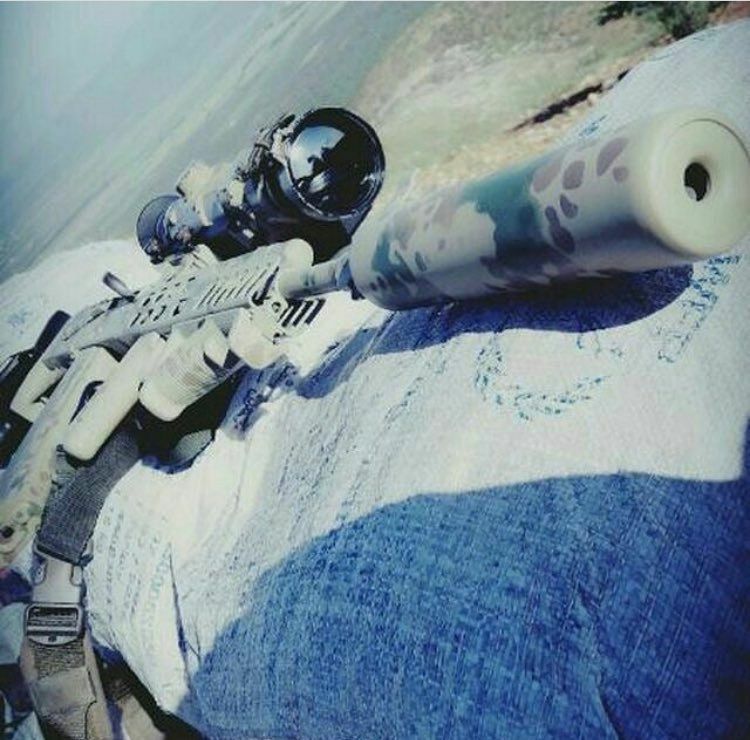 This rifle is fitted with a Pulsar Apex XD75 thermal optic, a scope, that whilst recently discontinued, remains extremely popular in Idlib, and can be seen attached to all manner of platforms in the Area, from M14 EBR-RI to AK-74M. The features of this rifle, however, provide greater insight. This spray-painted bullpup includes the high-tolerance magazine guide, aluminum foreend, and foregrip that many later rifles include, but uses a custom trigger guard that extends over the pistol grip that is not included with any other rifle. Similarly, the AK front sight block is shifted and joined onto the gas block in a manner similar to the AK-104, whilst the the barrel does not appear to have been shortened. It's therefore possible to conclude that this example is a very early model or possibly just an experiment that lead on to the much more recognisable Idlibi bullpup designs. 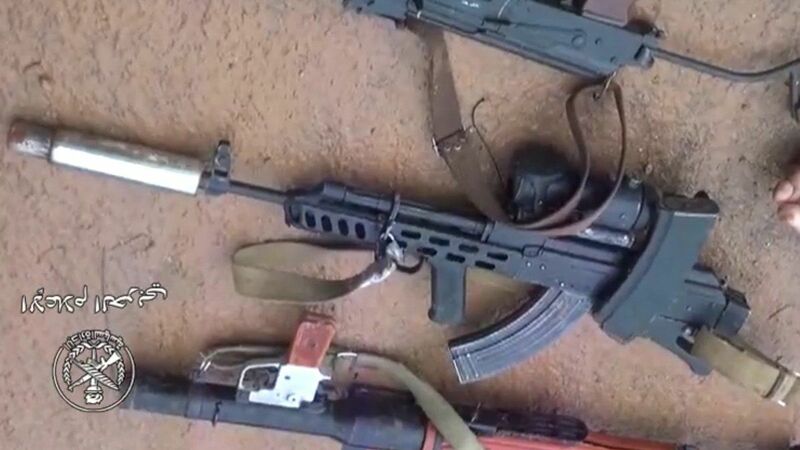 The next example of the Idlibi AK Bullpup that the author is aware of appearing is the above, which appeared in the hands of Liwa Al-Muhajireen Wal-Ansar in December 2017. It is much more recognisable, including the customary aluminium furniture, buttstock furniture, and common indigenous muzzle device. It's optic is again a Pulsar Apex optic, but is a newer and improved model- the XQ75, which includes a laser range finder. Also attached is a Pulsar EPS3I battery pack for prolonged operation of the thermal scope. 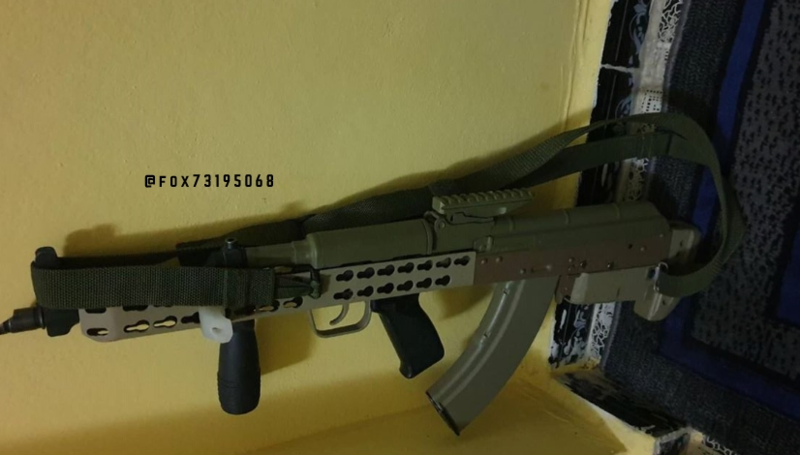 This rifle is extremely similar to later rifles that appeared both for sale in Idlib in 2018 & 2019, and those shown in use. It is hard to determine the actual creators of Idlibi bullpup AK, yet there are certain aspects that can be established. The gunsmiths behind the rifles are estimated with very high probability to be Russian or Chechen speaking, judging from social media and other, more closed sources. 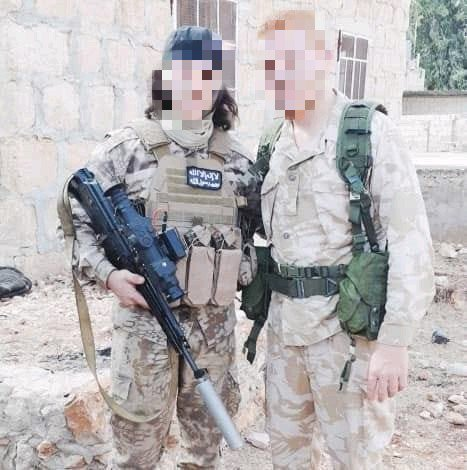 The rifles are most closely associated with Chechen foreign fighters too, in particular those associated with Hayat Tahrir Al-Sham, although other group's fighters have been known to use them- this includes Imarat Kavkaz and Ansar Al-Tawhid. Others have also used them- video exists of a French-speaking fighter testing an example, as well as Uzbeki fighters using them. It appears that some inspiration may have been taken from the Ukranian Malyuk rifles, with a example of that type shown as a comparison to a rifle for sale in early 2018. However, there is only so much design variation that the basic AK bullpup design can undergo due to the underlying design of the gun. They have not been seen in the hands of Turkish backed FSA fighters, despite the fact that custom shortened M16 rifles also made in the area have been. Due to the lack of available information coming from the area, this is about as much information as is possible to assemble from open sources, apart from the surety that this indigenous design is undergoing some standardised production, albeit with great allowance for personal preference. As mentioned, there appears to be two main variants of these rifles as of late 2018- "Full Furniture" and "Half Furniture" versions. The "Full Furniture" rifles have had the foreend furniture of the original rifles completely removed or covered (Appearences suggest both is possible, but that full removal is more likely- this would have weight benefits), both top and bottom. 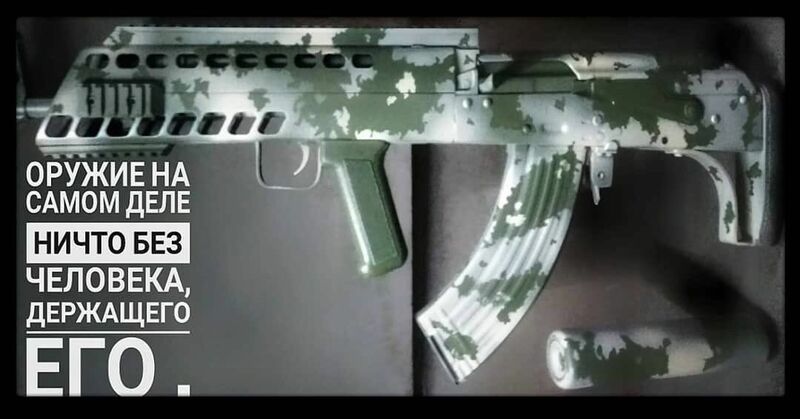 A partially finished Bullpup RPK with unpainted foreend. Note painted optics and magazine guide, possibly meant for another rifle. In place of the furniture, however, is attached (Likely welded) custom fabricated aluminum sheet, with weight saving vents stamped out. As part of this modification, the trigger guard, trigger, and pistol grip are removed and relocated to attach in front of the magazine area. The newly removed trigger must then be linked to the action of the rifle via a long linkage, although no images of these internals exist. It is likely similar in design to the many OTS bullpup AK conversions that exist on both the civilian and military markets. Also added to the rifle is a buttstock on the rear of the receiver, which is usually constructed from wood or sheet metal with a rubber pad from the original buttstock. Excellent image of a suppressed "Full Furniture" rifle, with Supressor and Dedal Night Optic. This is in the hands of Malhama Tactical. The rifle is also almost always painted, as well as custom picatinny rails added to the top of the newly-fabricated foreend of the rifle, as wll as to the side and bottom, to which a foregrip is almost always seen. Also added on occasion is a magazine guide, likely an attempt to mitigate the issue of translating the Kalashnikov "rock and lock" manual of arms into the bullpup format by providing some form of guidance for the magazine to enter the well. Note raised rail on both of these rifles, as well as coordinating suppressor. The second main variant of these rifles is the "Half Furniture" variant. These are so termed because these rifles omit the top half the new aluminium foreend that replaces the orignal furniture, usually leaving the gas tube unmodified, although very recent rifles have developed on this. Some rifles retain their original upper furniture, but others leave the gas tube bare. Otherwise, the "Half Furniture" rifles remain extremely similar to "Full Furniture" examples. They are also much more common, with 75% of close to 50 separate rifles recorded being of this type. They also seem to appear with custom or digital style camoflage paint patterns more often. Given the lack of top rail for these rifles, a different solution is used- a locally fabricated rear sight rail is used to convert the traditonal rear sight into a platform with which to mount optics. Though the rail is low profile, this does result in a higher height over bore than using the standard Eastern Bloc optic mounting solution, the side rail. Although these rails are indigenously produced, they are very similar to commercial products such as those from Strike Industries. Two examples with FAB Defence foregrip, and EOTech RDS+G33 Magnifier. "Half Furniture" type rifles with ACOG optics. 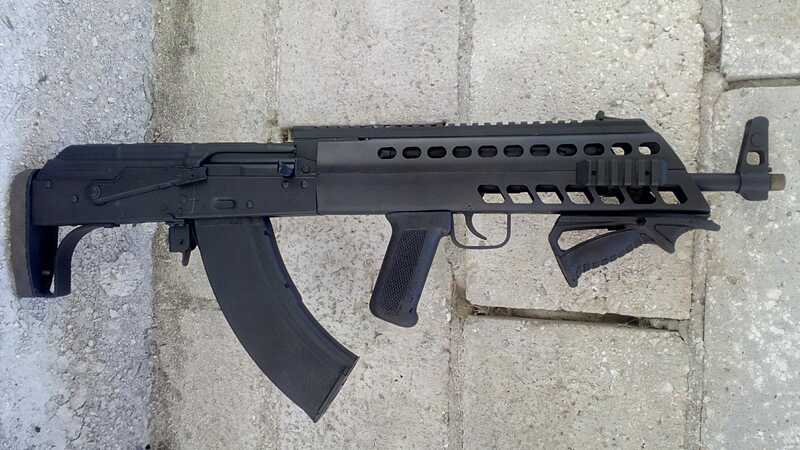 Some rifles have appeared with the upper portion of commercial railed AK handguards attached, although it remains by far the most common to simply leave the gas tube entirely exposed. Some of the best images available of this type of rifle were posted by a HTS/Malhama Tactical associated fighter. Whilst they are mostly monotone, they do provide an excellent opportunity to see the further details of these converted guns. 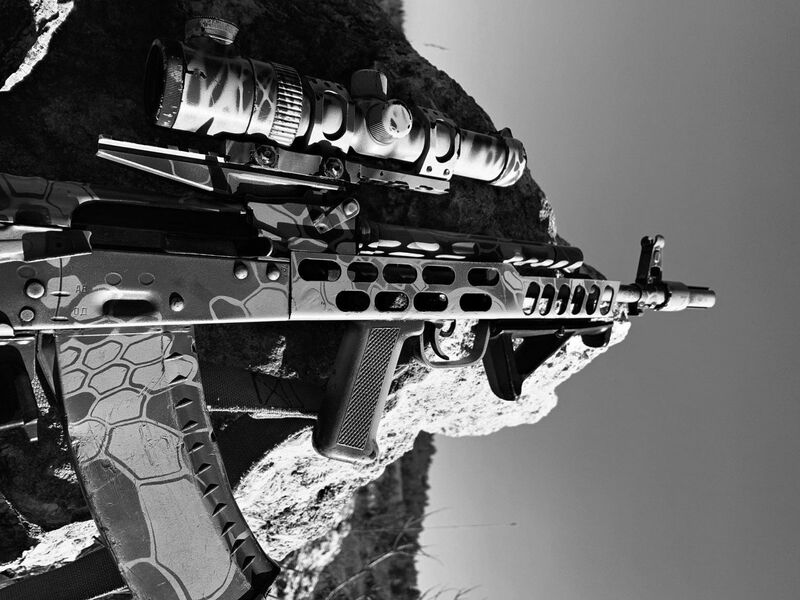 This particular rifle has been featured in a Malhama Tactical video in early 2019. The previous location of the trigger can clearly be seen, as can the shifted buttstock pad. The Vortex-style flash hider, common to many of these rifles (As well as unconverted AKs) is clearly observable. Given than many western accessories are popular in Idlib, this is no surprise. Another example of this is the FAB Defence foregrip, seen on many rifles in active use there. 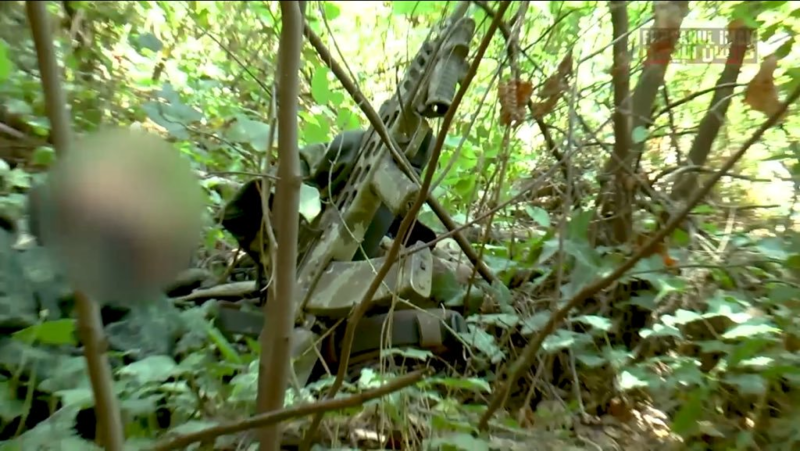 Note the extended magazine release - this appears to be a CAA AKMR. 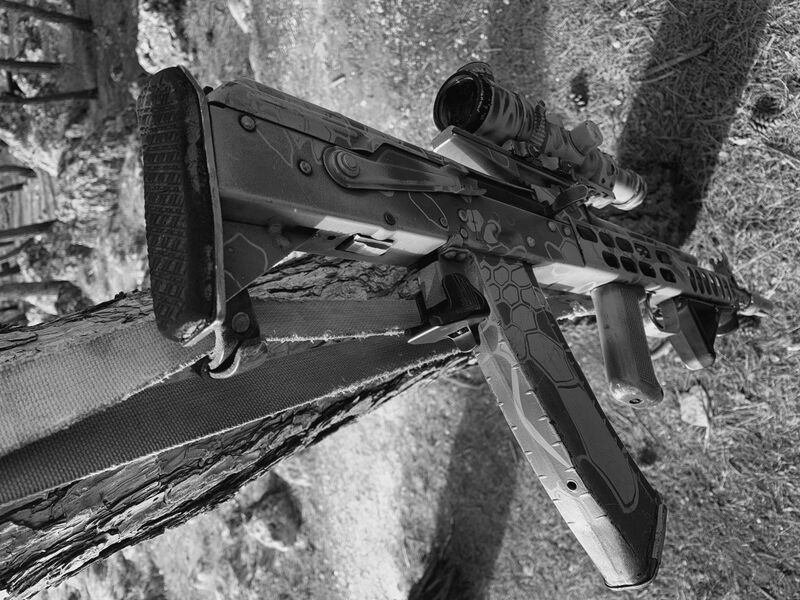 As previously observed, thermal scopes are a popular optic for the AK Bullpup, in particular the Apex series from Pulsar. These are ideal for night and dawn raids, as carried out by a variety of groups in Idlib against regime positions. Coupled with suppressors, these can be very effective to take opponents by surprise. 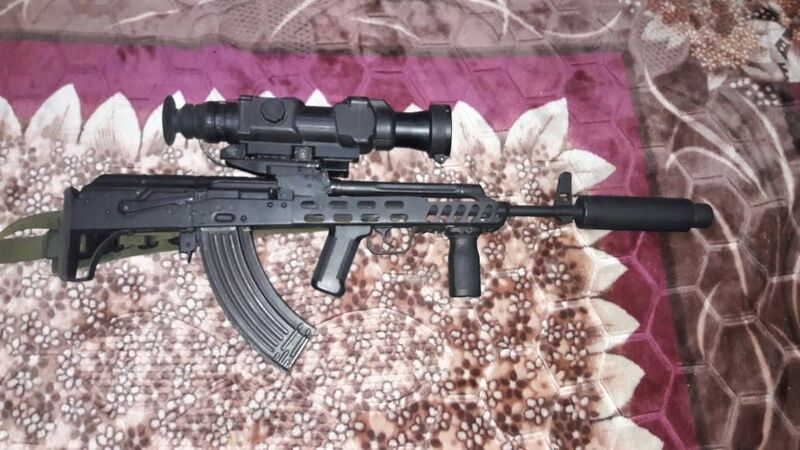 Given the expensive nature of these optics- several thousand dollars in Western markets, for example- it is no surprise that these custom AKs, specified to individual order, are coupled with them. It's likely the typical fighter purchasing both systems has a larger budget than those simply armed with the typical AKM. Other popular optics are Trijicon ACOG and EOTech RDS (Often with G33 Magnifier), both expensive solutions in the area, but regarded as superior. It can also be seen that an optics mounting rail- the original soviet solution- has been mounted far forward, enabling the use of optics such as the PO 3.5x21P by Malhama Tactical. The Idlibi AK bullpup is a fascinating indigenous adaptation of a extremely well known platform, utilising a existing base of talent to adapt the AK to a much shorter configuration. Whilst many commentators on social media naturally deride these conversions as ineffective and unneeded, it remains the case that some value must be found in them, or such a rich variety and amount of rifles would not be produced. 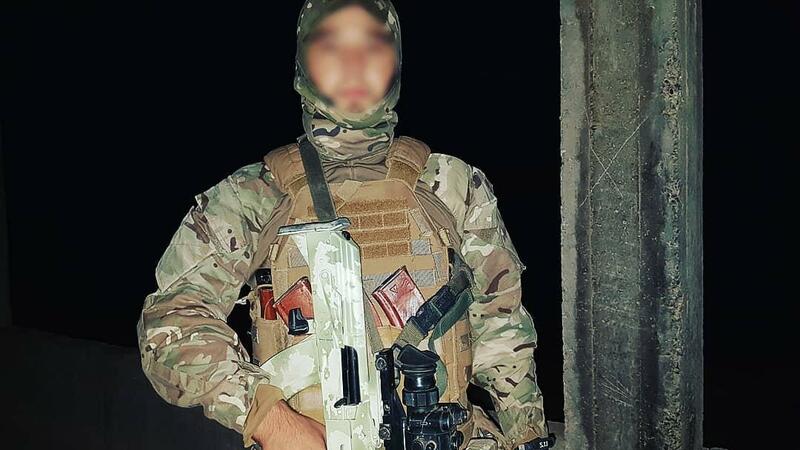 Malhama Tactical with both bullpup and conventional AK. The size difference can clearly be noted. Work on the platform continues, with the gunsmiths behind the conversions contiuing their work to add further options and to keep up with the times, even under austere conditions. To this end, further features can be seen on more recent rifles. Above, we can also see changes- a 3D printed thumb stop (Also known as "Gas Pedal", intended for facilitating the natural point of aim), attached via what appears to be an improvised KeyMod style rail (Keymod being a universal system for mounting of firearms accessories, originally created by VLTOR Weapon Systems). Whilst all the Idlbi Bullpup rifles have some form of rail, all except this are utilising standard picatinny rail segments to attach accessories. This appears to be a clear attempt to keep up with modern small arms trends- many modern assault rifles have now moved from the picatinny rail sections to lighter and more felible KeyMod systems. The use of 3D printed parts is also new. It's possible that the popular addition of a suppressor and thermal optic gives close to the ultimate rifle for the specific needs of the Idlibi fighter, even given the extensive ergonomic challenges posed by both bullpup rifles and even more so those of the Kalashnikov platform. Given the current nature of fighting between armed factions, both moderate and heavily Islamist, these rifles may be entirely appropriate. Such fighting is usually composed of artillery or air strikes by regime forces (Two areas in which the regime has close to total superiority), followed by retaliatory actions by anti-government forces. This usually takes the form of effective ATGM strikes and limited artillery, but first and foremost are sudden raids against regime-aligned positions. These usually take place at night or in low-light conditions, and may require flexibility between long-range effectiveness and the ability to fight at close range with a suppressor attached. However, given the lack of detailed operational information it is hard to determine what precise advantages are seen. 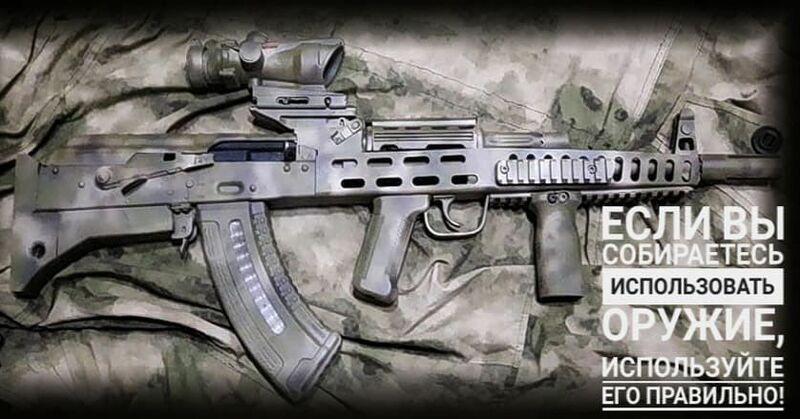 User feedback on the rifles varies- at least one foreign fighter has remarked that the AK bullpup is very good for close range combat, but suffers badly ergonomically, and a traditional AK is often preferred. 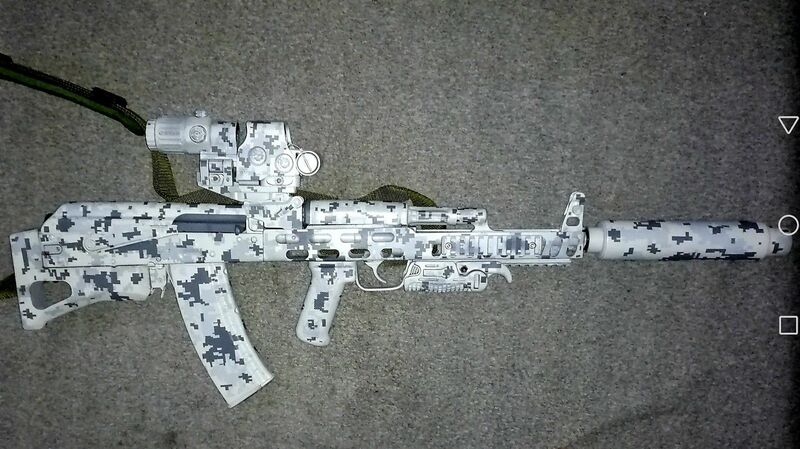 What's also clear is that great time and effort is put into the appearance of such rifles, so aesthetics may be a large part of the reasonings for these conversions- the huge popularity of the AKS-74U is another example of this. 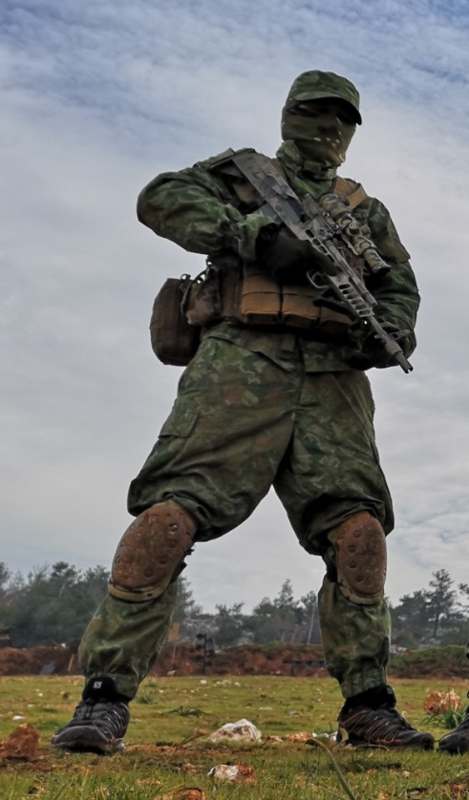 It's difficult to see how the needs of a Idlbi fighter for a shortened rifle can't be served by a carbine such as the AK-104, which can accept optics and suppressors, or indeed factory-made bullpup rifles such as the Steyr AUG. Both of these are widely available in the area, with the latter proving a popular platform for ISIS in Syria and Iraq for short-range sniping, thermal optics, and suppression. 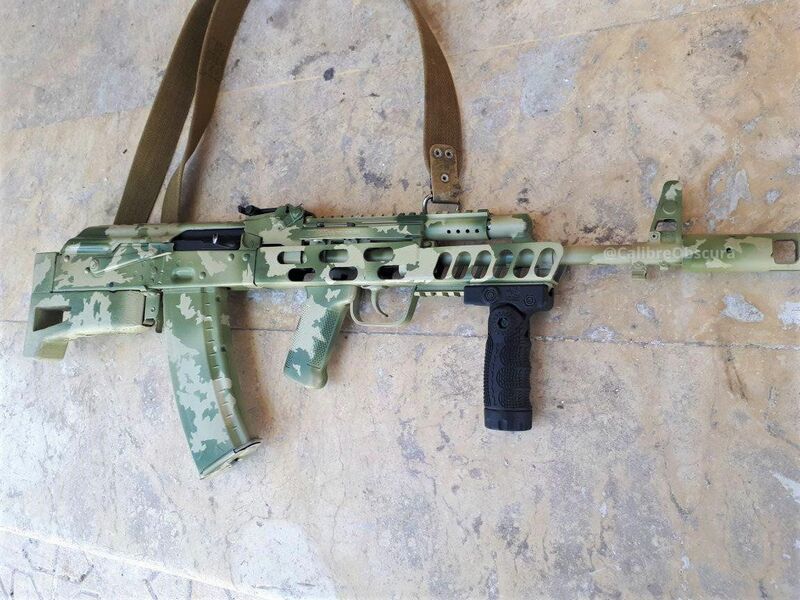 The development and use of the AK Bullpup in Idlib continues to be a fascinating example of innovation under restricted circumstances, making use of modern techniques and following modern small arms trends. I doubt that it's story will end any time soon. Most images seen are collected by the author from open sources, and/or gathered from other researchers.